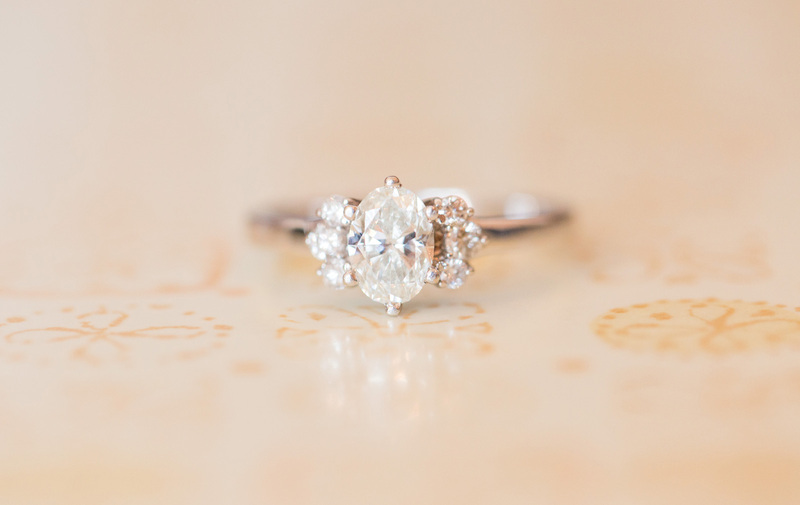 Family history is passed in the most tangible way through an heirloom ring. These three local wedding vendors’ rings stand out from those that they see every day because of their family significance. Bridal vendors live and breathe weddings so constantly that when it comes to their own big day, they want to separate themselves from all the commonalities they’re surrounded with in their work. The easiest way for them to stand out from their clients is with a one-of-a-kind family jewel to wear proudly on their finger. When local wedding photographer Debby Faught was ready to pick a diamond for herself, she knew she wanted something unlike anything she had seen before from photography clients. Her fiancé, Richard Cullum, chose and purchased the center diamond for her ring (above). The surrounding stones, however, came from a grandmother’s ring and one of her mother’s necklaces that was a gift from her father, who passed away before Faught’s wedding. As the time came for Gray Fobes, husband of florist and designer Julia Greer Fobes, to prepare for a proposal in 2012, not just any ring would do. One ring in particular wielded enough history to truly shine as a piece of art. The ring was originally a gift from Gray’s great-grandfather to his wife, dating back to the late ‘60s. It was passed to their son and daughter-in-law, Gray’s grandparents, upon their marriage. As their oldest grandson, Gray received the ring for his future bride. Marty and Rex Leatherbury now sell bridal pearls in their Fairhope antique shop, but when they got engaged in 1990, Marty’s ring came straight from the family tree. The gesture screamed Southern romance, but was also aimed at making the ring seem larger than life. Rex would later realize, though, that it was actually the perfect fit. Do: Get fitted. Rings can be adjusted if the size is wrong the first time, but it is best to be fitted before purchasing. But Don’t: Immediately resize. Our bodies go through many changes that affect our fingers. Unless you know your ring size is permanently changed, leave it to avoid over-working the band. Do: Remove your ring during certain activities. When you have a safe place to store your ring while cooking, cleaning or exercising, set it to the side. But Don’t: Remove your ring in non-secured places. Restaurant bathroom, public beach or hotel table? Keep your rock on your finger. It is better than leaving it behind to wind up in a lost and found box. Do: Utilize your jewelry box. The boxes or bags that rings come in are usually designed specifically for protecting that type of ring. But Don’t: Pull your ring from the top. Instead, remove your ring for storage by gripping your index finger and thumb around either side of your band for more protection. Do: Know your rock. Learn what makes your ring special and make it known. Once you know the ins and outs of your ring, you’ll be better equipped to recognize changes and avoid harmful damage. But Don’t: Hide your prize. Wear your ring and flaunt it with pride! No matter if it’s vintage or brand new, you deserve to show off your stone, not let it waste away in a dust-proof box.